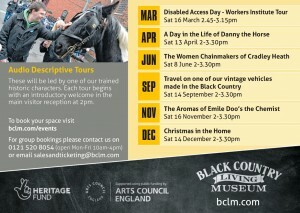 BCLM starts Audio Descriptive tours for blind and partially sighted visitors throughout the year. Each visit promises to be a sensory explosion of fun and discovery from our vintage vehicle journey’s to sensory smells of Emile Doo’s, the chemist. Come and take a turn in rolling your own pills, handling equipment and learning about the strange and wonderful ingredients used by chemists’ to treat all sort of complaints. Book early, and join in the fun on our “Christmas in the Home” tour taking place on: Sat 14 December at 2pm, get into the Festive Spirit by exploring Black Country traditions of Christmas past. Do you love animals? Why not join us on Saturday 13 April at 2pm and meet Danny the horse, and learn about what role they played and the importance of horse transport in the 19th Century. All tours are led by one of our trained Historic Characters, where you will have an opportunity to touch and handle objects and artefacts from the past. Pay for one day, visit for 12 months. (T&C apply see website for details). Don’ forget, you can arrive early and explore the Museum then visit Hobbs and Sons our award-winning fish and chips shop, all cooked in beef dripping for an authentic taste of the past. or enjoy other tasty Black Country meals in the Worker’s Institute. Each tour starts at 2pm in the Main Visitor reception, followed by your themed tour in the Museum. Come and learn about the Black Country whist exploring our Houses, Cottages and Shops, accompanied by your very own historical character as they reveal inspiring stories from the Black Country and beyond. Booking is essential – please contact us on 0121 520 8054 (lines open Mon-Fri 10am-4pm) or email salesandticketing@bclm.com to reserve your place. We have 20 places on each tour and they will be distributed on a first come first serve basis. All successful booking will be confirmed via email.